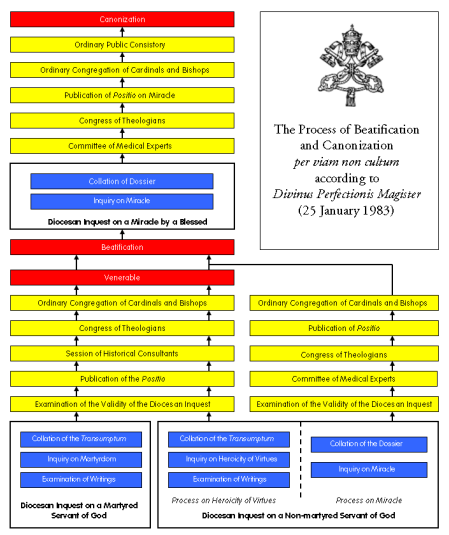 According to the provisions of the apostolic constitution Divinus perfectionis magister and its Normae (promulgated on 25 January and 07 February 1983 respectively), a beatification cause may be initiated by a petitioner five years after the death in fama sanctitatis (with reputation for holiness) or in odium fidei, uti fertur (presumably killed out of hatred for the faith) of one or a group of professed Catholics. This petitioner [actor in Latin] may be an individual or, as commonly practiced, a group (e.g., a parish, a religious congregation, a diocese, an association of lay faithful, or even a civil body) duly recognized by ecclesiastical authorities whose task is to finance and promote this enterprise. However, the pope himself could waive the required five-year waiting period, as in the case of Mother Teresa of Calcutta and John Paul II. The petitioner must name a postulator who must be duly recognized by the bishop of the diocese where the Servant/s of God died (canonically referred to as the competent bishop). A postulator is the lawyer of the cause and representative of the actor before the Congregation for the Causes of Saints (CCS), the Vatican office that has direct jurisdiction over such matters. He/she may also appoint a vice-postulator who acts in his/her behalf within the diocese . It is the task of the actor, through the postulator, to request the competent bishop to launch a formal diocesan inquest into his/her/their life. On the same time, the CCS designates a protocol number to refer to the case. In case the bishop of another diocese were to act, for a legitimate reason, as the competent bishop for the cause of someone who died outside the jurisdiction of his territory, he would have to obtain the decree for the transfer of the competent forum (« competentia fori ») from the CCS. Divinus perfectionis requires the competent bishop to consult with the bishops of his ecclesiastical region on the appropriateness of initiating the cause. He must also publicly publish the petition of the postulator and invite the faithful to report to him any information they may have on the Servant/s of God. Then, should he decide to officially initiate the cause, the competent bishop must assign two theologian-censors to examine both published and unpublished writings of the Servant/s of God . A favorable opinion from them is necessary to proceed with the cause. After this, he assigns a promoter of justice whose task is to draw up a questionnaire for witnesses based on everything that has been collected concerning the cause. Finally, the competent bishop must obtain from the CCS the rescript nihil obstat , which would certify that nothing in the records of any Vatican office would merit a suspension of the inquiry. At this point, the CCS ascertains the decree on validity of the diocesan inquest. Having done this, the congregation appoints a relator to the cause. An official from the CCS, the relator’s task is to supervise the writing and publication of the positio by a collaborator (who may or may not be the postulator himself/herself). The positio has two essential parts:(1) the informatio, a critical biography of the Servant/s of God based on the transumptum; and (2) the summarium, a collation of the testimonies of the witnesses during the diocesan inquest and documents relative to the life of the Servant/s of God. It will be examined by three different bodies of experts - historians, theologians, and prelates - who work for the CCS and whose votes would determine the final outcome of the cause. When these three bodies unanimously give a favorable decision on the positio, the CCS draws up a decree on the heroic virtues or martyrdom of the Servant/s of God. Normally, this decree is formally read and promulgated before the pope in a public audience. From then on, the Servant/s of God begins to be referred to as Venerable. In the case of martyrs, what follows is the designation of the date for the solemn beatification. For non-martyrs, however, another decree is needed. The Vatican requires that one exceptional miracle be proven to have been wrought through the venerable's intercession. When this is found, the postulator and the bishop of the diocese where the miracle occurred must petition the CCS to open a diocesan inquiry. All records gathered during this inquiry are to be sent to the CCS, which then appoints a body of qualified physicians or scientists, the consulta medica, to judge its extraordinariness. A favorable judgment from this body is presented to the theologians and prelates of the CCS. The pope who formalizes his recognition of the miracle through a decree. Only then can the non-martyr's beatification be finally scheduled. Source: Fabijan Veraja, Le Cause di Canonizzazione dei Santi (Vatican City: Libreria Editrice Vaticana, 1992).